Join the discussion on our forums! Come discuss Simulacrum over in our dedicated Simulacrum discussion topic. Copy the lowest Cost minion in your hand. I don't get the flavour of this card. The effect doesn't seem to have anything to do with a simulacrum. How does this card decide which minion to copy if the lowest minions in your hand are the same casting cost? The draw order? This card is amazing when you can't find second Sorcerer and found this spell from Primordinal or Cabalist's Tome. Look, I don't say that this card is amazing and must be used at Exodia Mage, this card is good but not good to put this to Exodia Deck. 3 Mana is too slow. I mean, you need to use this card before playing Sorcerer. Huge tempo loss. For Freeze Mage, people says "can be used in wild to copy emperor thaurissan to get double value" wrong. Drakkari Enchanter allows you to get two value at ONE TURN, which is more valuable, because each way you spend 9 mana in one turn and i think this is more better and faster. Thus, this allows you to OHKO unarmored enemy (Alex -> evolved kobold -> frostbolt -> 2x icelance) Better way to counter Priest. Ridiculous. This helps the Mage quest in two ways: first by giving us one of the six off-deck cards required to complete the quest, but in addition Sorcerer's Apprentice requires this type of card to explode the combo. That you did not like this card and that you doubt it can enter your deck is one thing. But it is clear that when you get it through one of the many cards that give a random spell (or via Discover) in your hand, it will appear to you as a "Meta-Defining" card. This card doesn't help in quest progress though, it generates a copy of a minion, not a spell. You're getting downvoted a lot because people don't realize your point, it doesn't make the quest (spells out your deck) easier, it makes getting multiple Sorcerer's Apprentices easier and if you draw two Simulacrums early with one Apprentice you can even throw a few out for tempo plays (assuming two molten reflections are still in the deck) with arcane intellect and cabalists time to help you cycle until you find Archmage Antonidas. Molten Reflection for a minion you actually want to use the battlecry off of. Slightly slower, but more versatile. Not a bad card. You also have to pay the cost of the minion though whereas with Molten Reflections you don't. Let's say you have a 3 mana minion with a good battlecry, through this card you get another one and play it. you just used 6 mana to play a minion that was good at 3 mana, that minion is probably absolute trash at 6 mana. I can see this being played in Reno mage but not in any other mage deck. I have it as playable simply because it's hard for me to gauge whether this is the piece that Quest Mage needs to break standard or just a red herring. This card copying either Arcane Giant or Sorcerer's Apprentice will certainly help bring some added consistency/earlier combo turns for both flavors of the Quest Mage but I'm just not sure what you cut from those decks and they're already pretty fringe. Good with Kabal Crystal Runner but especially great with Arcane Giant. Slower version of Molten Reflection. Not bad. 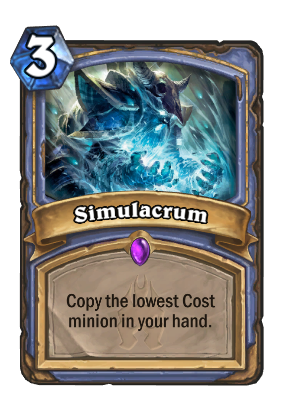 This will be for safely copying sorcerer's apprentices in quest mage, or gives quest mage more consistency if they draw this from a random effect. It's also worth noting it copies the cheapest one in hand, in mage, as far as I've seen, you tend to play most of your minions as they come into your hand instead of holding onto them (Tony and Alex being exceptions). It's not exactly impossible to get Yogg copies, although then you could argue as to how valuable that actually would be.